being sick, tired, stressed or in pain?" A rapidly growing complementary health modality effective at rebalancing the body so that it can return to excellent health with energy and emotional strength. The body is like a bio-computer and is able to communicate its imbalances through muscle testing to reveal an accurate picture of problems which block the body's healing process. Kinesiology uses muscle testing for assessing and balancing the body's innate healing abilities. It brings together a mosaic of healing techniques such as ancient Chinese philosophy, acupressure and other reflexes, massage, nutrition, counselling, essences, neurological techniques, supplement testing and modern day scientific knowledge. For desired changes to occur in our health, lifestyle and attitude we need to work with the whole being rather than just one part, and in this way we are able to work on the cause of our problems and not just the symptoms. Once the body is in balance and has the appropriate nutritional support, it is able to heal itself. Natural Medicine takes an individual and holistic approach to your health. Massage has been used for centuries for therapeutic purposes and relaxation. In massage the soft tissues of the body are manipulated by kneading, percussion and stretching. The respiratory system may need some help getting over a cold by applying lot of percussion moves. Massaging the abdomen will increase blood supply to the liver and intestines plus increase peristalsis of the intestines thus helping digestion. The lymphatic system benefits indirectly as muscles pushed and kneaded move the lymph through the system. The nervous system is calmed and soothed through relaxation massage. The muscular system is benefited by increased blood supply which reduces abnormal contractions. The circulatory system is increased by blood supply back to the heart and increased oxygen supply to the tissues, also removal of waste products. Remedial massage involves a postural assessment of the body to identify muscle and postural imbalances and to isolate muscles not functioning as they should. Different techniques are then used to help correct these imbalances. The techniques used include massage, myofascial release, trigger point, positional release, cross fibre and joint mobilsation. Deep Tissue massage is performed using deeper slower strokes and works on stretching and releasing the connective tissue surrounding the muscles. Manual Lymphatic Drainage involves the stimulation of the lymphatic system with gentle rhythmic strokes. This helps the lymphatic system to eliminate metabolic waste products, excess fluid and bacteria from the body. Every living cell has a specific Electro chemical value or Electric Charge. Healthy cells, on average have a -70 millivolt charge. Whenever we have injury, illness, sickness, or disease, the Electro chemical value is reduced. The body is made up of millions of tiny electrical currents and impulses interacting throughout the cells. The electricity from the PER is formed into a circle by the loop applicators, and the waves of this electromagnetic field then pass through the cells at a very powerful, very fast rate. The spin of the electron is increased, and this usually last about 4-5 days. This in turn restores or replenishes the cell. Think of this process as "recharging the batteries" inside of you. In biomesotherapy, a sterile saline solution is injected under the skin along with oral homeopathics which can assist with acute pain, including headaches, migraines, muscle and joint injury, digestive discomfort and neuralgia. It is still fairly new in Australia, but more than 70 million treatments take place in Europe each year. Biomesotherapy is a very effective relatively painless technique. The Dorn method is based on the correction of uneven leg length, which, according to Dorn, can be diagnosed in almost every human. Because of that, the pelvis is said to become twisted, and this can result in an asymmetrical, crooked or displaced spinal column. Dorn uses a non-manipulative approach to correct such problems. Corrections of joint or spinal cord misalignments are done in a 'dynamic', moving action. According to Dorn, our muscles always try to hold the positions of the joints and spine, and when they are out of order the muscles assume this 'wrong' position as the correct one and hold it there. Colour Light Therapy is a holistic form of treatment, seeking to promote or re-establish physical, mental and emotional well-being. It can benefit almost anyone, ranging from people affected by specific conditions to those with more general or diffuse complaints. The therapy is a deep healing technique involving the application of light beamed through special clear quartz crystals onto various points on the body to help restore well-being to the individual by renewing the body’s energy systems. Over 2000 years ago, Chinese medical writings described acupuncture channels with transporting energy (Qi) around and through the body. Qi is said to be influenced in specific ways at acupuncture points which lie along these channels. When Qi flows freely the body will function well, when Qi becomes blocked, organ function is impaired and symptoms of illness will appear. Traditional Acupuncturists believe that gentle stimulation at precise acupuncture points with applied on the basis of correct diagnosis, will aid the body’s own defensive and self healing systems, thus promoting and maintain good health. An acupuncturist can simulate acupuncture points by several methods including, but not limited to, heat (moxibustion), magnets, laser and fine disposable acupuncture needles. Naturopathy is a holistic approach to wellness based on the principle that the body has the inherent ability to heal itself. Using the healing power of nature and gentle therapeutic techniques, the body, mind and emotions are supported during the healing process. Naturopathic principles are based on treating each person as an individual and treating the whole person, not just the affected area. Naturopathy can alleviate a wide range of conditions and is suitable for all ages. Some of the more common conditions treated include fatigue, stress related ailments, digestive problems, PMT and general aches and pains. However, you do not need to be unwell to benefit from naturopathy. Naturopathic treatments boost the body's natural healing potential, restoring harmony and preventing disease. The modern form of naturopathy can be traced to 18th- and 19th-century natural healing systems. Such systems include hydrotherapy (water therapy), which was popular in Germany and nature cure, developed in Austria, and based on the use of food, air, light, water, and herbs to treat illness. Benjamin Lust, a German immigrant, first introduced naturopathy to the United States in 1902 when he founded the American School of Naturopathy. The school emphasised the use of natural cures, proper bowel habits, and good hygiene as the essential tools for health. This was the first time that dietary principles, like increasing fibre intake and minimizing saturated fats, became popular. In the mid-1920s to 1940, while allopathic medical training and pharmaceuticals and medical technologies gained notoriety, the use of naturopathic medicine declined. It was not until the 1960s that naturopathic-style holistic medicine regained popularity. Today, naturopaths are licensed primary care providers in many states offering information and advice on a variety of alternative and complementary therapies, including homeopathy, vitamin and mineral supplements, Traditional Chinese Medicine, relaxation techniques, and herbal remedies. 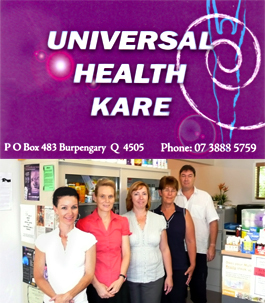 Copyright(c) 2010 Universal Health Kare Pty Ltd. All rights reserved.